‘The Dead Matter,’ Haunted Cornfield Edition! The Dead Matter-themed haunted cornfield maze attraction opens in Iowa. 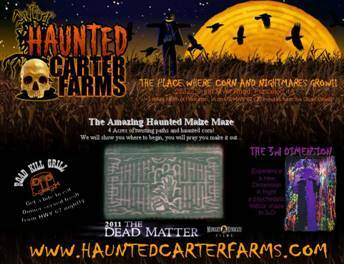 October 13, 2011 (Cleveland, OH) – Haunted Carter Farms, one of the oldest haunted cornfield mazes in America, has chosen to theme this year’s attraction after Midnight Syndicate Films’ 2010 dark fantasy horror film, The Dead Matter. The design of this season’s 5-acre maze blends cover art from the DVD and elements from Midnight Syndicate’s The Dead Matter: Cemetery Gates CD. In addition to taking guests through scenes from The Dead Matter movie, haunt designers took themes explored in the film and developed their own additional original scenes. Music and several original props from the film will be featured in the attraction. The haunt is open every Friday and Saturday in October and Halloween night from 7:00pm to 10:30pm. Admission is $12. For more information visit: http://www.hauntedcarterfarms.com. On a side note, The Dead Matter is also now available in Germany on both Blu-Ray and DVD through Euro Video. The version includes both English and German dubs as well as 5.1 mix. It is currently available at Amazon.de.